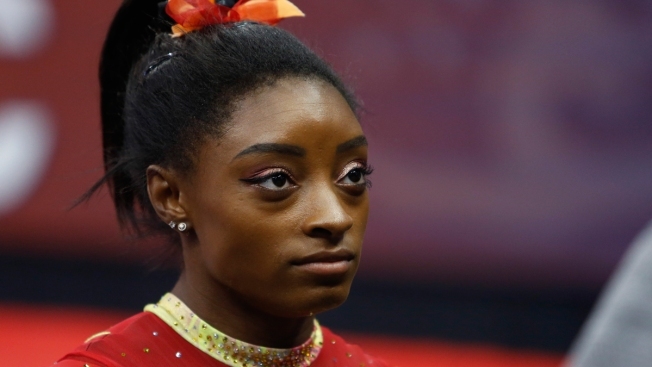 Simone Biles quote-tweeted Bono's photo and wrote: "(asterisk)mouth drop(asterisk) don't worry, it's not like we needed a smarter usa gymnastics president or any sponsors or anything"
This July 28, 2018, file photo shows Simone Biles in Columbus, Ohio. Olympic champion Simone Biles is upset about an anti-Nike tweet from USA Gymnastics interim president and CEO Mary Bono. Bono was appointed Friday to hold the position while USA Gymnastics searches for a permanent successor to Kerry Perry, who resigned under pressure from the United States Olympic Committee in September after spending nine months on the job. Biles responded Saturday to a tweet from Bono last month criticizing Nike following the release of its advertising campaign featuring former NFL quarterback Colin Kaepernick. Bono, a former Republican congresswoman, had posted a photo of herself drawing over a Nike logo on a golf shoe. Biles quote-tweeted Bono's photo and wrote: "(asterisk)mouth drop(asterisk) don't worry, it's not like we needed a smarter usa gymnastics president or any sponsors or anything." Bono deleted her tweet about five hours later, saying she regretted the post and respects "everyone's views & fundamental right to express them." Nike is one of Biles' sponsors. Biles is among the more than 200 women who have come forward over the last two years claiming they were sexually abused by former team doctor Larry Nassar under the guise of treatment. Biles was critical of Perry for not being vocal enough in support of the survivors.